The order in which Texas Hold’em is dealt is very specific and, assuming you’re playing with a table full of lucid, honest people, never changes. First, you are dealt two hole cards. Then comes the flop, turn and river cards. After a round of betting for the hole cards, a card is burned off the top of the deck (meaning discarded without being looked at — this is done in case the top card had somehow been exposed or marked), and three cards are dealt face-up to the center of the table. This is known as the flop and is the start of the community cards on the table — those cards that everyone may incorporate in his hand. Everyone who has not folded now has a five-card hand — two hole cards combined with the three community cards. A round of betting takes place. After the flop betting round, another card is burned from the deck and a fourth community card is exposed. This card is known as the turn (sometimes fourth street). All players still in the hand now have six cards to choose from to make their best five-card Poker hands. There is another round of betting and one more card yet to be exposed. A card is burned and the most infamous of community cards, the river (sometimes called fifth street) is dealt. All remaining players have seven cards for selecting their best five-card Poker hand (their two hole cards combined with the five community cards). A round of betting takes place, and the best five-card hand at the table is the winner. 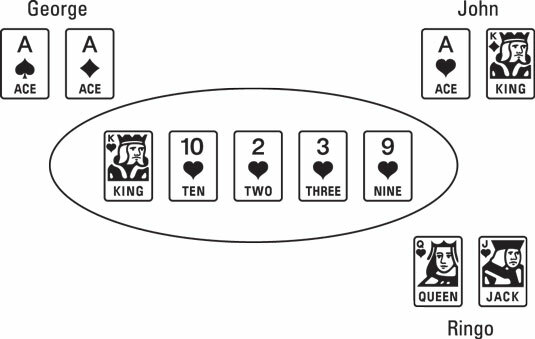 To determine their five-card hand, players may use zero, one, or both of their hole cards in combination with five, four, or three community cards, respectively. Because a player is required to use at least three community cards to make a hand, there can be no flushes if there are not three cards of the same suit (multiple suits with no flush possibilities based on the current exposed community cards is known as a rainbow). Nor can there be a straight if there aren’t three cards from a five-card sequence (for example, 5-8-9). Here, George is playing the board and has a king-high heart flush. John is using one hole card for an ace-high flush, but Ringo is the big winner using both hole cards for a straight flush. Each player using a different number of hole cards to determine a hand.